IT staff recently expanded two technology services based on feedback from students, which have improved students’ residential experience at the University of Rochester. 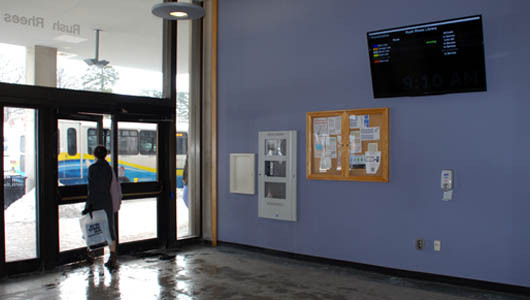 In February, University IT mounted a 60-inch LCD panel in the rear entrance of Rush Rhees Library to help students at the popular bus stop track their shuttle’s current location and estimated arrival time. Technology & Media Production installed a 20-inch display in the vestibule of Eastman Commons in the Student Living Center, which provides bus tracking as well as a schedule of events and performances at the Eastman School of Music. As part of a digital signage initiative, “the next phase of development will include an expanded list of Student Life events that are happening daily,” said Jake Cebula, Associate Director of Computing Services at the Eastman School of Music. Both screens display information from TransLoc, a GPS service introduced in the new bus fleet in January 2013. Real-time bus locations and arrival tracking are also accessible in the University’s free app, UR Mobile. Rush Rhees Library and Eastman Commons are the first of four proposed locations for live shuttle information. Future installations are planned for Riverview Apartments and the Medical Center. This initiative is the brainchild of Ana Garcia ’14, who proposed the project for her Kaufmann Entrepreneurial Year (KEY), a competitive program that offers undergraduates a fifth, tuition-free year to pursue entrepreneurial activities. Garcia served as a Projects and Services Aide with the Students’ Association for two years, an experience that ultimately inspired the project. University IT also expanded University wired and wireless network service to Riverview Apartments, a 120-unit student housing complex on South Plymouth Avenue, located across the Genesee River from River Campus. Expanding the University network to Riverview provides a consistent experience for students whether in their apartment or in academic spaces on campus. It also simplifies access to University systems and digital resources, some of which require users that are off site to log in or connect remotely to the University network.